I’m very excited to share the twenty-sixth episode of the Woolful podcast. 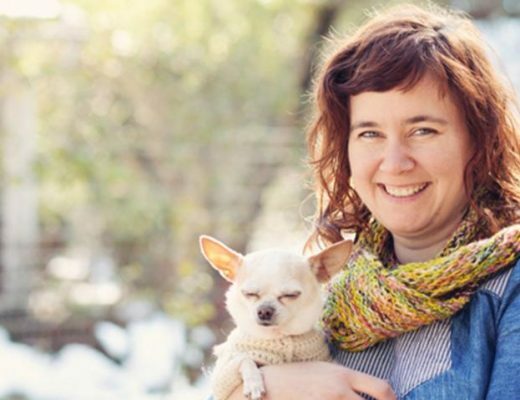 This week we get to meet a woman who many of you have heard of because of her incredible pursuits in the fiber community, Hannah Fettig of Knitbot. 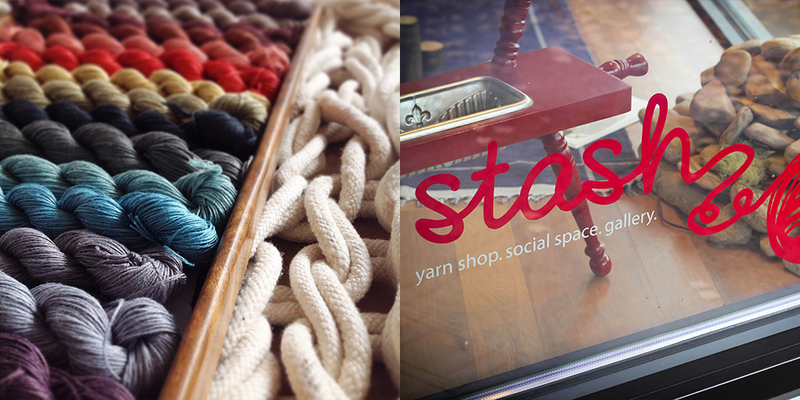 Sponsor: I wanted to thank one of our sponsors for this week’s episode, Stash, a local yarn shop based in Corvallis Oregon. The owner, Sonia was a very early supporter and encourager of the podcast and it’s been so great to get to know her a bit and watch all the positive energy she puts into her shop and fiber community. When in the Corvallis area, make sure to visit and you can find more info at stashlocal.com. And you don’t want to miss a pretty special event coming up, Black Sheep Gathering, a fiber festival in Eugene Oregon June 19-21. Stash will be there with a selection of special yarns and fibers from some of their favorite PNW indie dyers. So make sure to mark this on your calendar and find Sonia and her gang of Stash Enhancers. Fiber folk: I first got to know Hannah last year when we sponsored each other’s podcasts, her’s being the infamous knit.fm with Pam Allen. I quickly learned how much she cares about sharing this passion of her’s with others, so that they too can experience all the wonderful facets of this community. Her effort to create simple, timeless designs and tools has been an inspiration and encouragement to so many makers and their handmade wardrobes, including my own. What I love most though is Hannah’s desire to pursue her ideas while putting her family first. You can find Hannah at knitbot.com and on Instagram @knitbot. Man on the street: For this week’s “Man on the Street” I asked a follow up to last week’s question: “When you’ve lost your fiber mojo and then re-ignited the spark again…what do you do to nurture that little flame until, once again, it becomes a warm fire?” We had some great answers from Kerry @kerryrobb, Leanne @leannecoppola, Maria @ninja.chickens, Nikki @fernfiber, Amy @urban_farm_wife, and Samantha @samanthamaylamb. Giveaway: The winner of last week’s giveaway, is Kelsey Sylvia ! You’ve won 2 skeins of Powell from Mountain Meadow Wool. Congratulations! The giveaway this week is sponsored by Knitbot and Quince and Co, and we’re giving away Hannah’s new book, Home and Away AND a projects worth of yarn from Quince and Co…you pick any pattern from Home and Away and Quince will provide the yarn! To enter this giveaway, leave a comment in the comment section at the bottom of the post page. Sponsor: I wanted to make sure and thank another one of our episode sponsors Cream City Yarn, which was created by best friends, Kris Porritt and Lisa Ruesch in Brookfield, Wisconsin. I just love the inviting environment that Kris and Lisa have worked so hard to bring to their local fiber enthusiasts, in addition to a wide selection of natural fibers, vibrant colors, and engaging classes all year long. 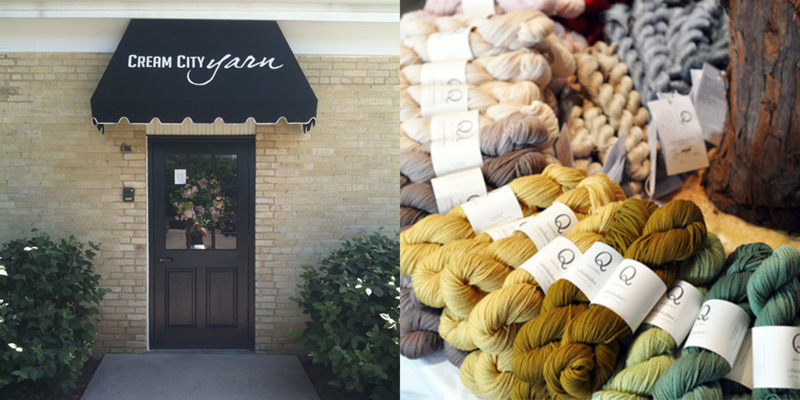 Be sure to visit Cream City Yarn if you’re near or passing through the Milwaukee area. You can also find them online at shop.creamcityyarn.com. I would so much love to win this time. Maybe I will get lucky to win this beautiful book and lovely yarn! As always, a wonderful episode. I really enjoyed the interview with Hannah. And thank you for he chance to win! What a generous prize. Loved this week’s podcast!! Another talented designer to learn about. Thank you Ashley! These patterns are quite elegant. The idea of have both top-down and seamed patters is really great. Yay, I’m so excited about this podcast as I’m crazy about Home & Away – such a beautiful book & patterns. I’ll be listening as soon as I get home from work! luv this designer. I have made and have lived in the sweaters I’ve knit from this creative mind. Her designs are lovely and her patterns are wonderfully made, thought out. Moto- jacket calls me from this new book- cannot wait to cast on….. Awaiting my book I ordered recently. I have been waiting for this book to be published and for my LYS to order it. I would love to win and own this terrific book (and the yarn to knit a sweater!) Love the podcast, Ashley. Keeps getting better and better. I absolutely love your Podcast and I would be so happy to win this weekends giveaway! I loved hearing about Hannah’s journey – so inspiring and fun! Also, so excited to check out knit.fm now! This book would be a lovely addition to my knitting library and there is no question I would find a fabulous pattern for the fabulous yarn! I really enjoyed listening to the knit.fm podcast, and it made me really curious about the yarns from Quince & Co. I would be very happy to have a chance to knit something from Hanna Fettig’s book! Looking forward to this podcast! love Hannah and Quince and Co.! I love listening to Hannah Fettig discuss knitting. Thanks for such an enjoyable episode. Recently, I purchased my first Quince & Co. yarns, and love them! I would be thrilled to have Hannah’s latest book, and the yarn. Quince & Co yarns are the ones I use the most. I love their simplicity and unique colors. It’s be great to win this prize! Love your podcast. The content really puts it in a unique place. I have been a fan of Hannah’s patterns for quite a while.I have her first book, and I have been trying to get Knitbot.. But Q& CO had in the website that the Ebook was out of stock. I asked about it but got no response.Didnt know how a Ebook could be out of stock.? The new book I definitely want as well.I hope perhaps to find a vendor of the books that can send easily to me Down Under !! Love Hannah’s comfortable simplicity.Portland Maine is a cool place, spent a small amount of time there in 2003 on the water front and some interesting shops ( a woolshop I think?) Near a ferry location for going to an island for a nice holiday.Nice memories .Hannah’s designs fit into the feeling of the area ..
PS.. Ashley totally always eagerly awaiting each pod cast .. Thanks for helping me know about such awesome peeps and fibre. Quince is the ultimate, for yarn and patterns! I’ve knitted things for gifts out of quince yarns, would love to have something for myself! I love the look of Hannah’s designs. The Georgetown cardigan would be the first thing I would try. Congratulations on a great podcast. Hannah has done an amazing job with the book Home and Away, so unfortunate that I can’t buy it in Australia, but I’m looking forward to getting at least an electronic copy. I really fell in love with the Moto Jacket. I love Hannah’s designs. The Georgetown cardigan would be the first thing I would try. Congratulations on a great podcast. I love the designs in that book, so beautiful. I would love to win this awesome prize!!!! I am so excited about this episode, I love knit.fm! And this giveaway, wow, thank you for the chance to win. While listening to this week’s episode I was thinking about the things I want to knit this year and how enthusiastic I feel about it, and then it dawned on me: Your podcast is like oxygen flow to may knitting sparkle! Thank you Ashley and all your lovely and interesting interviewees! Oh wow, I’ve had my eye on this book. Can’t wait to listen to this! Maybe a lunch hour listening session is in order. I can’t wait to listen to this episode. What a lovely prize! It would be wonderful to win. This prize is a dream! A lovely book and gorgeous yarn! I’m so excited about this book! What a great giveaway and with Quince & Co. Yarn!!! I love Hannah’s designs so am excited to hear her interview. I love this podcast, and I love the Home and Away sweaters! I loved listening to knit.fm and hope to knit one of Hannah’s sweaters soon! carries quince, and only 2 weights so i have to order online. but opening a package from them and beginning the cast on always a thrill. Wow what a giveaway!! I would die to be able to start on another sweater from Hannah’s book this summer! What a generous giveaway! I love Quince &Co. Yarns and Hannah’s designs. Hannah is one of my favourite designers, and I would be SO happy to win this giveaway. I mean the yarn! The patterns! Swoon! That is the best giveaway ever, I really love the patterns in that book and the yarn is a bonus. Thank you! Oh, WOW, I want to win this one like crazy! I love listening to Hannah, and it’s great to hear that knit.fm isn’t gone for good. Just discovered your pod cast and so excited to listen to all the older ones! I have been a fan of Hannah’s designs for awhile so it was really fun to hear her discuss her process! Thankyou for asking all interesting questions! This delightful collection… A project’s worth of perfect yarn… A DREAM come true. Thank you, all you makers! Waiting along the day your new podcast is every week a wonderful pleasure. Thanks a lot ! I’d love to win the giveaway, Home and Away has such lovely patterns! I love using quince yarn. It is so squishy and wonderful! Love Hannah’s designs! They are so beautiful!! The podcast to hear her journey was a complete delight! Love the calligraphy cardigan pattern! I’ve been eyeing that one for awhile. Thank you for the interview, simply wonderful! YES! Spectacular giveaway. I love Hannah and Pam’s knit.fm podcasts and here she is on my other favourite! Thank you Ashley! Yeah! Hannah Fettig’s book. I love her designs. Thank you, Ashley and Hannah, for brightening on Tuesday morning at work with this week’s podcast. I’ve been plotting since Home & Away was released what project to start with once I have the time! Quince & Co yarn is fabulous, too. I would love to win this! I haven’t won a giveaway in who knows how long, I send out my good luck juju! Lovely interview with Hannah, so interesting to learn more about her. Another great podcast. I love them. So inspiring. And getting to know (a bit) the designers makes it so special when knitting one of their creative designs. I am so glad you are doing these programs. Keep them coming!! Thank you, Ashley and Hannah, for another wonderful podcast! And what a beautiful book! So love how very interesting these podcasts always are! Awesome, awesome, awesome. What a skill you have for drawing out something in your guests that always feels immediately relatable. I would, deep breath, L O V E, to win this week’s heavenly prize! And, though I was listening carefully to Hannah’s words about reality vs perception, I’m going to go ahead and imagine those lovely, serene-with-a-wildside Quince models pulling and packing yarn for me to knit Hannah’s Moto Jacket. Of course, this whole scene is lit in that special Maine light. Yay, its Tuesday and that means another Woolful Podcast! I really like Hannah’s designs, the patterns in this collection included. I would love to win this very generous give away. Thank you! I love Hannah’s designs and Quince yarn! Lovely podcast today! Super excited about this episode, as a graphic designer, I’m really happy to see a well done book of patterns. So often knitting pattern books can be rather hard for me to follow along with because of the aesthetics that leave me wanting something a little more organized. Alsoooooo super pumped about Cream city yarn holding it down for MKE! 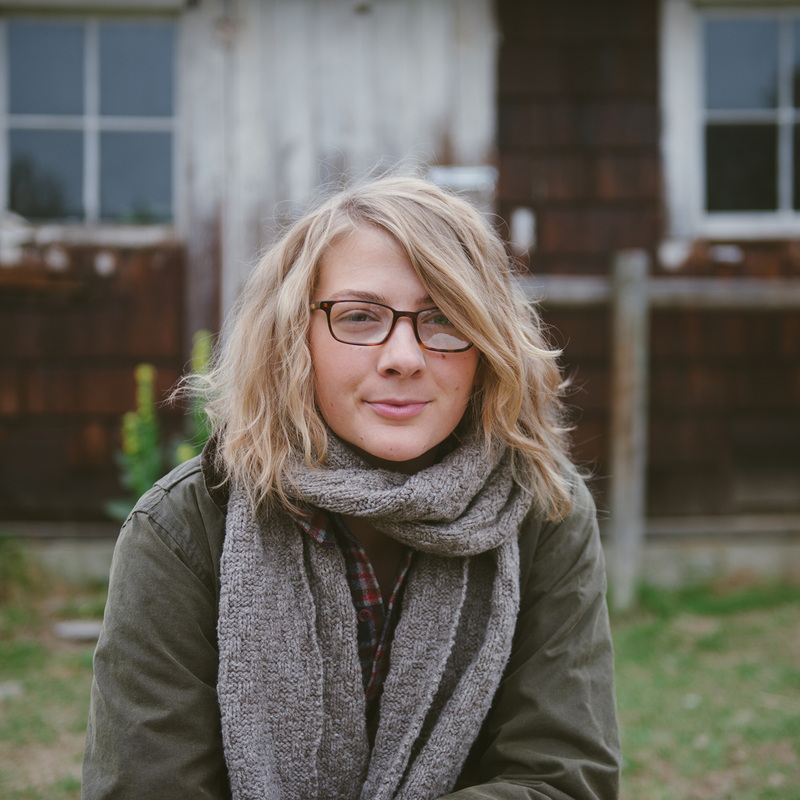 Hannah is one of my all time favorite designers….my sweater chest is chock full of her designs. Almost all have been knit on Quince yarn as well. I would absolutely love to win this week’s giveaway….but if not, I will soon be purchasing her new book, and Quince yarn to complete one of the projects in the book. Thanks for another wonderful episode. You do such a great job. Thank you for another inspiring episode! I’m so excited to join in your July KAL. Good vibes. Great episode. I’ve been wanting to knit a couple of Hannah’s patterns for a while now, and it would be lovely to be able to knit one with Quince and Co. yarn! I love Hannah Fetig and her designs. And I love Knit FM! I’m so happy to hear Hannah planning on more episodes — I sorely miss listening to her and Pam Allen speaking words of knitting wisdom. 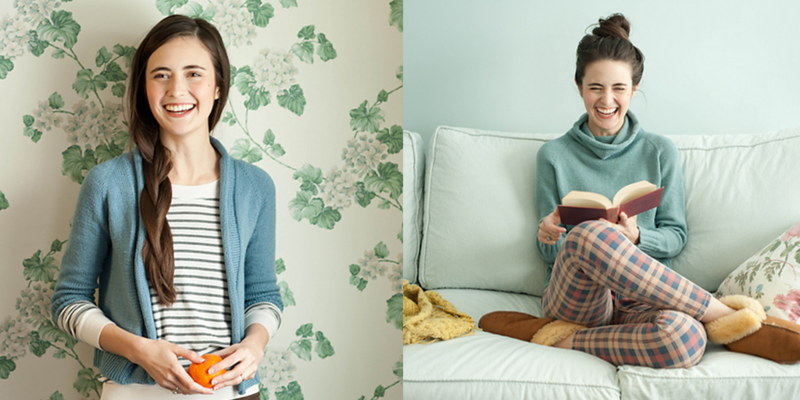 Love Quince and Co and am excited about this giveaway — and about the July knit along! WOW, that’s a generous giveaway! I’ve not had a chance to knit anything in Quince’s yarns yet, so I’d love that…AND the fabulous book! Can’t wait to listen to this episode! I had heard about Stashbot but never knew what it was- this was so informative, and it’s a fantastic app! How have I knitted so long without it? Thank you! I have been loving your podcast and the different interviews that you do each week. It has definitely inspired me to look into working on a sheep farm and getting in touch with wool production. And the sound of the spinning wheel at the beginning of the podcast is such a wonderful touch (well at least I think thats what the sound is). Thank you for the podcast and for the giveaway. Home and Away is so beautiful, I’d love to have it in my library! Thanks for the giveaway! Quince!!! Love the patterns and the yarn… AND (of course) the woolful podcast! Beautiful give-away! If that wouldn’t return your knitting mojo, nothing would! Thank you for making it possible. Great podcast again! I just found your podcast/website via Cream City. Looking forward to listening! I so love to here those stories, thank you! I so enjoy your podcast, this one is a favorite! Beautiful book and yarns! What a wonderful giveaway. Thank you for the opportunity. This was such an awesome episode!! My two favorite podcasts rolled into one. I just finished knitting Hannah’s Featherweight Cardigan and LOVE it. I hope to knit something from her new book very soon! I love the simplicity of Hannah’s designs; I have quite a few of her projects on my list. Thanks for another lovely listen! best thing about one of my clients not showing up today was getting to listen to the pod cast! all these great knitters in Portland; I will be there this summer and have such a wish to run into someone! thanks always for making these knitters and crafters real and a bit known! I .loved, loved this episode with Hannah. I will definitely be taking a closer look at her new book, Home and Away. I miss her podcast and am glad to hear that there will be more in the future. I’m currently knitting the Featherweight Cardigan – the seamed CustomFit version. 🙂 It would be really cool to win this book. Been a fan of Hannah Fetig’s designs since the Whisper cardigan. Ooh, Featherweight too. This collection is just as lovely. Love Hannah and her designs! The stashbot app is amazing, and my computer science boyfriend nerded out over it too! 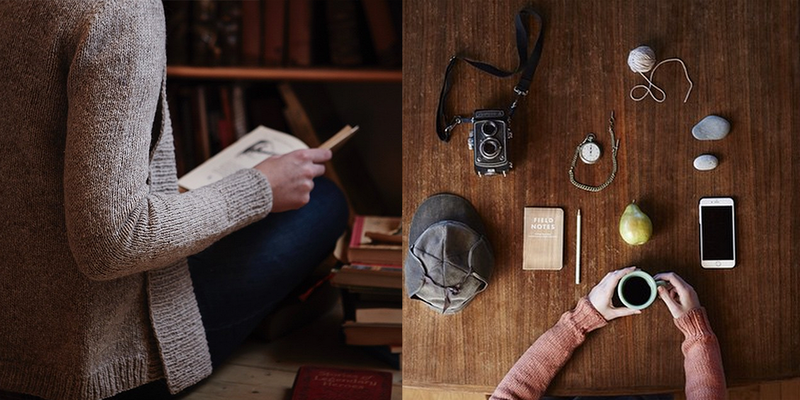 A sweaters worth of yarn to knit one of Hannah’s sweater would be a dream come true! Loved this episode! I just bought this book from my LYS and thoroughly enjoyed learning more about how it came to be. Gosh – I love Hannah’s new book. My very favourites from among her patterns are in there. Please please please! I have been lusting over Home and Away and would love to win!! I’m such a fan girl of Hannah Fettig! Thanks for this interview. I only just started listening to knit.fm and the woolful podcast and it was such a lovely surprise to hear Hannah on this newest episode. I look forward to participating in the next KAL with Hannah’s newest book! I love the podcast and can’t wait to cast on the Georgetown cardigan in the near future! So lovely once again! Thanks for the chance to win. What a generous giveaway! Hope I win! I love Hannah’s new book! And your podcasts, which I just discovered a few weeks ago. What a lovely prize! What a fabulous offering! I can’t wait to hear this episode from a fellow Mainer. Love Hannah Fettig, I was a huge fan of Knit.fm; my yearning for more of her podcasts led me to yours, which I also love dearly. 🙂 I’ve been eyeing the Georgetown cardigan from her new book, this is a great giveaway. Looking forward to the knitalong! Oh wow, I would so love to win this book and yarn! I’ve lusted after the Quince & Co yarn for years but shipping and exchange rates for Canada have always kept me from ordering. I have the knit boy/quince essentials book and just started my second project in it. I love Hannah’s designs! Thanks for this awesome podcast. Such a great podcast this week! Thanks for making my commute painless. It was so fitting to hear Hannah this week. KnitFM is how I found Woolful and there is so much great info. I’m always inspired by you. Thanks again. Thank you for another great episode! I always look forward to each one! Thank you also to Hannah and Quince for the giveaway!! I sure would LOVE to win!! Love this! such a fantastic giveaway. Home and Away looks so beautiful! Would love to win! Love Hannah! Miss her KnitFM podcasts. This was so wonderful to listen to! Love Hannah and her work and I’ve been through all the Knit FM episodes twice and can totally hear Pam Allen’s voice saying the SAME thing in my head!!! Too funny 🙂 And what a generous giveaway! I love Quince and Co. yarns so much! Absolutely my favorite. Hannah’s new book looks stunning. What a great giveaway! Absolutely gorgeous! Would be beyond excited to win! Love your podcast. So happy to hear that Hannah Fettig and Pam Allen will continue their podcast too! I love so many of Hannah’s designs along with Quince! Crossing my fingers for the giveaway !! I’m so excited to have found you. The podcast is wonderful and the book looks amazing! Oh just think of all the luscious things I could knit from it! I’ve never wanted to win so badly:) I love Hannah Fettig’s aesthetic; it was so fun to hear her talk about it! Thanks Ashley. What a great episode! It is great to hear about Hannah’s fiber journey! Loved this podcast! Love Hannah’s designs! Thank You! Great podcast. Thank you for sharing this story! Always inspired by her work! What a generous give-away. Plan to add this to my library very soon! Oh how I love all of the Knibot patterns! And I have a MAJOR crush an everything that Quince and Co does. I have so many of their patterns on my “to make” list! Great giveaway. I can’t wait to see this book! This is the perfect giveaway! I’ve had my eyes on Home & Away for what seems like forever, and I’ve been wanting to try Quince and Co. yarn for quite some time as well. I loved hearing Hannah on a podcast again! I’ve still got knit.fm “subscribed” in iTunes, just in case a new episode pops up. 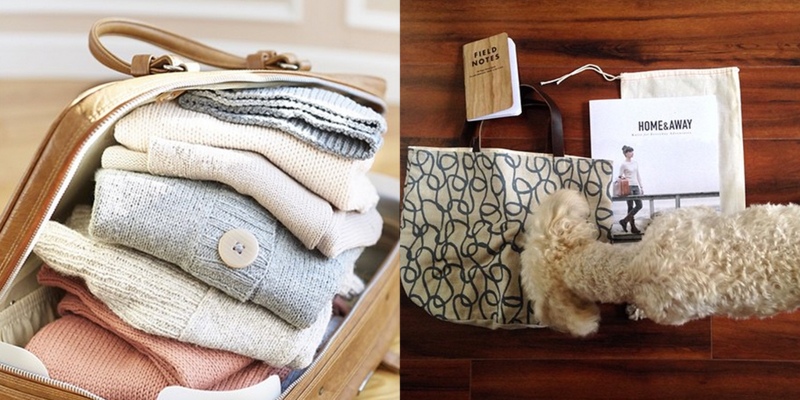 I’ve got my eye on several Home & Away cardigans — would love to jump one to the top of my queue! Love the podcast and love the patterns. I’ve never knit with Quince & Co but would surely welcome some to my stash. Loved everything about this podcast. The chance to win such a generous prize is amazing. Thank you! I really enjoy your podcasts. They are interesting, the guests knowledgeable, and most seem to have had incredible journeys. This is a great designer and a fabulous gift for one lucky listener. As always, I continue to be in awe of this podcast and so extremely inspired as a maker and life liver. Thank you for sharing your talent with the world! Oh, I love Hannah’s designs! Thanks for yet another thoughtful and inspiring episode, and for such a wonderful giveaway. I LOVED listening to this episode. I’m a big fan of Hannah Fettig, her designs, and of Knit FM. What a treat to spend time with both of you today. I really hope I win this amazing prize! Lovely to hear from one of my favourite knitwear designers. I’m keen to knit a project from Hannah’s new book, as well as try Quince and Co. yarn for the first time too. I’ve been drooling over the pictures in that book for awhile! Winning this would be great! What a great podcast and giveaway! I loved this episode. I love them all actually. I would love a to create one of the pieces from this book too! Thanks! What a wonderful episode and giveaway! I thoroughly enjoyed hearing about Hannah’s journey and it inspired me (as always when I listen to Woolful) to work on my own first designs. A sweater’s worth of yarn sounds incredible! I have longed to try Quince and Co. And haven’t yet had the pleasure. I’d LOVE to win this one! Thanks for the opportunity! I love Hannah’s designs, what an awesome giveaway! Quince & Co is one of my favorite yarn companies, for many reasons. I’ve never made a sweater & would love to have an excuse to get over myself & cast on. What a fabulous give away! I really enjoy your podcast and find all the episodes very informative. There are several designs in Hannah’s new book Home and Away that I really like. Congrats on another fantastic episode! I love Hannah’s work and could definitely use another simple and beautiful cardigan in my life! I would LOVE to win! I am a huge fan of woolful and of Hannah’s discontinued knit.fm– both so informative and pleasant to listen to. I have been eyeing Hannah’s book for a little while now! Great conversation on tech/life balance! I love Hannah ‘s designs! I seriously had goosebumps listening to the man on the street segment on ways to restore passion for knitting. I am loving the week in a cabin in the woods idea! Thanks for this lovely gift of this podcast and for honoring the fiber community with it! I have been waiting for an interview with Hannah Fettig! So excited it’s finally here!!! What a wonderful episode. I love Woolful the same way that I loved knitfm. It’s like being in the room with people just talking about something they are passionate about. And what a wonderful giveaway. I am planning to get Home and Away (and Knitbot Essentials), but was waiting to pick a yarn first. I’ve knit with Quince & Co. once and would love to use it again. Thanks to you, Hannah and Quince & Co. for this great giveaway and another great podcast.. This episode of Woolful made me swoon ;). While each episode captures my attention, Hannah Fettig is the one knitter who has made me brave enough to explore sweaters and cardigans, rather than just shawls and hats. Not like I don’t continue to knit those as well. Thank you and Great job – I will be listening to this podcast episode again! Just learned to knit recently…..love the projects in this book and the fact that a novice can actually feel like they are doable! Beautiful! Another amazing giveaway! Such classic designs, in such beautiful yarns. Thanks for the chance to win!! What an awesome giveaway, the perfect yarn for such beautiful patterns from a talented designer! I already know which pattern I want to knit! Boy, would I love to win a sweater’s worth of yarn from Quince. Great podcast! What an awesome giveaway, the perfect yarn for beautiful patterns by a talented designer! I would so love to win this one! I love these designs and the Quince yarn. Rosemont and Georgetown are my favorites. I love knitbot and would love to win Home and Away! I’m currently knitting Breezy and I just love the simplicity of Hannah’s designs. I’d love to make Calligraphy in a teal or bronze, but it has to get in line behind Featherweight. I would love to have this book. Looks inspiring. Best yet to win a copy. I love Knitbot designs and would be just delighted to win Home and Away. Nothing will get done at my house if I have the book and Quince yarn! I have fallen head over heels in love with Home and Away!! I am currently in the throes of knitting for autumn/winter and Hannah’s designs would fit just perfectly within my wardrobe!! Thank you for featuring this wonderful designer – such a beautiful book! The Moto Jacket is going in my queue…. Hannah’s book Knitbot yoked inspired me to knit my first sweater for my boyfriend. A huge step for me, and so glad to see that she has continued her amazing work with this new release. Get it, girl! You rock! I love listening to your podcast when traveling without my boys. Such a treat! Thanks for the great giveaway…I have one of Hannah’s patterns from Home and Away in my immediate queue. Made multiple sweaters from Coastal knits & looking forward to making the Moto Jacket from Home & Away! Your podcasts still bring me great inspiration although I am a little behind these days with catching up on the episodes. Thank you so much for making the fiber community feel so closer to me. You do a wonderful work! I love listening to this podcast on my way to work. I’m currently knitting my second sweater by Hannah Fettig and would love to knit several of the designs from Home and Away. Hannah is such a talented designer especially for the basic garments we all need. Such an interesting interview. I Iook forward every week to this podcast! WOW! I’ve been longing after Quince yarn for aaagggeeesss!!! This is the best giveaway of my life and I hope so badly that I win! Always look forward to listening to your podcast. Love Hannah’s designs and Quince and Co yarns. Great giveaway! Listened to this episode while knitting on my featherweight cardigan in Quince yarn and missing Portland! What an amazing offer for someone lucky! Love listening to your podcast, Ashley. I absolutely love your podcast and the patterns in this book look fantastic! I’m currently working on my first sweater and can’t wait to make another. I always enjoy hearing from designers and how they got started and what their life is like. Thank you for this wonderful episode! Thanks so much for another great episode! And what a beautiful giveaway this week, love this book! Thanks so much for another great episode! I would love to knit one of her beautiful sweaters! I just recently got my first taste of Quince yarn – Finch – and I LOVE IT! I’m making a pair of socks with twisted stitches and the stitch definition is perfection. I’d love to win this contest and taste another Quince product. 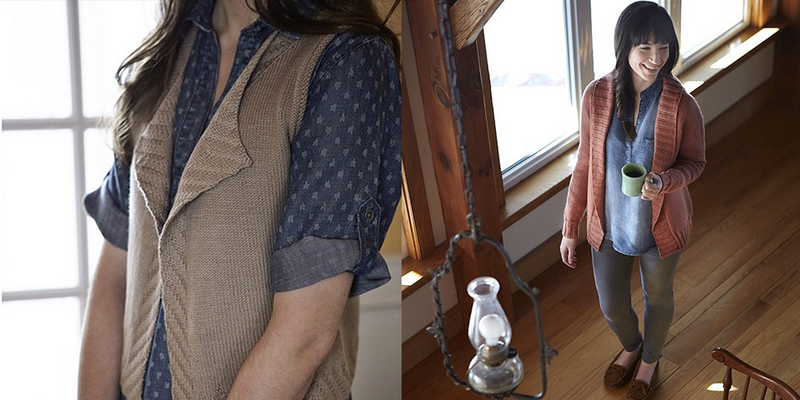 I’ve been a follower of knitbot for a while and always love her patterns and maine sensibility. Being in New England, I appreciate her inspiration from water, the shore, and nature in general. This giveaway is RIGHT UP MY ALLEY. I’d be honored to receive a copy of Hannah Fettig’s book along with Quince & Co yarn! What a treat that would be. Looking forward to listening to this one… I have a few to catch up on too! Thanks for these podcasts! hannah’s book looks amazing and I would love a copy! I really love all these sweaters, and I plan to knit all of them! I would probably start with Boothbay, though. Thanks for the opportunity and a wonderful podcast! Great podcast! I love Hannah’s sweaters! Oh this is TOO god! that would be good, not god….. although god is also good…. I’m a bit behind on episodes… catching up! Lovely episode, and a generous giveaway! Hannah Fettig’s designs made me want to start knitting seven years ago, and I’m so pleased she has remained successful. Thanks! I can’t wait to listen to this episode this weekend while I work on my Plaits and Links cardigan. I think the majority of the knitting patterns on my Knitting Pinterest board are by Hannah Fettig! Hearing about Hannah’s inspiration for the photography and feel of in Home & Away made so much sense after looking at it. She’s such a great designer and a thoughtful knitter — and I will definitely be getting Stashbot now! Portland, Maine has the coolest little fiber community! Only makes sense considering how cold it gets in the Winter, but still the cluster of talent here is really remarkable. Hooray for Hannah! Love that Home and Away has instructions for seamless as well as seamed garments. Brilliant!! Love the podcast, love getting to listen to so many unique fiber stories. Thank you!! Wow! What a great podcast. Episode 26 is the first podcast I have listened too. I was very excited to find out about another podcaster in San Francisco and Idaho to boot! Also made a purchase today so excited to see the yarn when it comes. I wasn’t sure if this was the correct place to post for the contest or not, but I would be very excited to get the new Hannah book and wow Quince yarn is so nice too!! Another great episode! 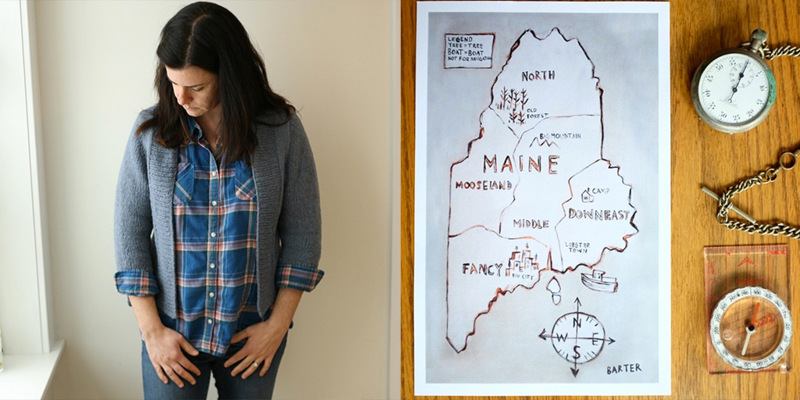 I’m so excited about the Maine fiber scene and Hannah and Quince are my favorite parts of it. I recently visited Knitwit in Portland Maine just to shop for Quince yarns and it was so lovely. Love the timelessness and simplicity of Hannah’s designs… they gave me the confidence to try “harder” projects in my early knitting days. Would love to have this collection in print, and Quince’s yarn makes any project extra lovely. what a treasure this package will be …I would love to see arrive in my mailbox! I really enjoyed this podcast with Hannah. 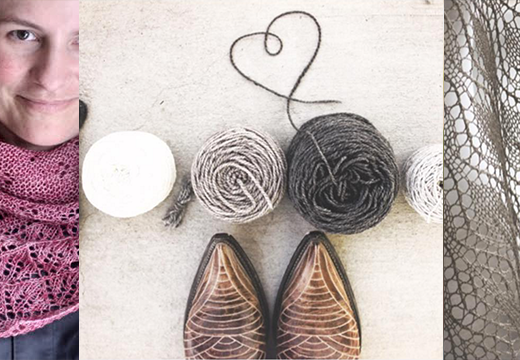 Her passion for family, knitting and the simple life is refreshing in this busy world we live in. It is also encouraging to see people succeed in this industry and to have hope in never giving up on your dreams. I can not wait to join in on the next KAL as I have been drooling over Hannah’s new book and designs on Raverly. I have also never worked with Quince and Co yarn so I am looking forward to that!! I enjoyed this podcast, and enjoyed knit.fm very much. I can understand that time constraints and family time mean that quality podcasts come and go as lives change. As for knitting mojo, I am most inspired by quality podcasts such as woolful and knit.fm ; thanks for carrying on at this time with your podcast, Ashley. I would love to win a copy of Hannah’s new book and the yarn to knit a project with! I have been wanting to try out Quince and Co yarn and Hannah’s designs fit perfectly within my wardrobe! Thanks for the opportunity! This was an awesome episode, I’ve missed Knit.FM!!! I would love to win this. I absolutely enjoy your podcast – each and every episode and I’m amazed at the variety of people you are able to interview. All types of makers. Thank you! Good heavens that’s an awesome giveaway! I loved your conversation with Hannah. I’m such a fan of her and her work! I love knitting and listening to your podcast! I’ve got my fingers crossed about the really wearable sweaters in the book! What a giveaway! I looked through a friend’s copy of Home and Away and picked a few sweaters I could make myself. I am so inspired by your podcasts and my favorite LYS Tolt Tarn and Wool and the wonderful fiber community that make me feel at home! Hanna’s podcast was amazing and inciteful. I would be so blessed to win the book and yarn! I have been listening during my long commutes for the last 4 weeks to get caught up and reached this week’s episode this morning! Thank you creating this wonderful podcast for all of to get to know more people in the greater community. I loved this episode! I am a fan of Hannah’s patterns, and the new book is very much my aesthetic too. Great giveaway! I have been wanting to try some Quince and Co – I’ve heard so many good things about it! Thanks for featuring Hannag this episode. I really enjoyed hearing more of her back story and it’s got me browsing her pattern collections again. Love Hannah’s new book. Beautiful patterns. Looking forward to co for the KAL. Loved this interview with Hannah and so excited that you are having a KAL from Home & Away in July! I’d love to win the book & yarn! 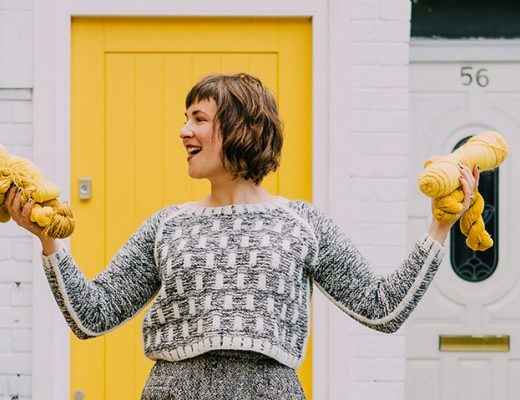 Love your podcast – and this one was another favourite as Hannah Fettig, Quince and The Fibre Company are all knitting icons of mine! Knitting, and listening to this inspiring podcast, are keeping me sane this year while I do my Masters Thesis. So far – as a stress relief and reward for writing 🙂 – I have knitted several gifts. But I would LOVE to knit one of Hannah’s designs for myself, what better reward!! I really enjoyed this episode. So true about social media / emails / screens being addictive and how important it is to be mindful and proactive in allocating time to what matters. I love the designs in Home and Away – simple, classic, staple cardigans. Thank you for this interview! I can’t wait to participate in the KAL next month and this giveaway would surely get me started. I would totally love to win the book and the quince yarn, but I guess I’ll buy it anyway. Have a great day!!! I have been checking out the patterns from home & away and love them all! I also am a big fan of quince & co., lately almost all of my knitting has been in quince & co. yarns! As always another great podcast! Going to listen to the podcast while I’m knitting this morning. (Point of view vest by Hannah with sparrow by quince and Co) What a generous giveaway! Love the book and quince yarns. As always, I enjoyed your podcast tremendously. I bought Stash Bot and the e-book of Hannah’s patterns after listening. Thanks so much! very generous giveaway! I have been wanting to try out some quince & co yarn for quite some time. It would be so wonderful to win that lovely book and gorgeous yarn by Quince & Co! I’ve been longingly looking at their yarn for ages, so winning some would be awesome! Thankyou for this opertunity! Great episode! So looking forward to knitting some of these beautiful pieces. Thank you for the opportunity to win such a special prize. I’ve knit many of Hannah’s patterns. It was great to hear her talk about what drives her passion. Great episode. What a great episode. I’d love to knit so many of the patterns from Home and Away, love Quince yarn too! Oh my goodness! What an amazing giveaway. I would love to knit anything from Hannah’s new book and I’ve never tried Quince & Co. I would love to give them a go. What a great episode! Hannah is amazing. This is the most incredible giveaway, and so generous! I’ve been a fan of Hannah’s for years, and I’m so glad to have found your podcast through her. thank you so much for this podcast. i anxiously await it every week. it’s my favorite thing. i tell all the fiber folks i know about it. & i’m so excited about this amazing giveaway! thanks for the opportunity. thank you for another amazing episode!! I love your podcast and the way you explore little known facets of the fiber industry and community. Thank you for the work you do and for the giveaway opportunity! Wow, I love this podcast and the generosity of the sponsors always amaze me! Oh I’ve been waiting to get Hannah’s book and I love her designs! Thanks for a lovely podcast and giveaway. LOVE your podcasts. Just the best! I loved this week’s podcast! I’m lusting after Hannah’s book, so I’m *really* keeping my fingers crossed that you’ll pull my number! Thanks for the chance to win each week. Good interview! I may cast on a Knitbot pattern for my very first sweater. I would love to become better acquainted with this designer and try some of her patterns. And have wanted to knit with some Quince & Co yarn for quite some time. This is such a wonderful giveaway! Thanks for a fantastic podcast and blog! Hanna and Quince and Co are my favorites!! While listening, I got a chill and put on my rocky coast cardigan from Coastal Knits, and just had to order home and away. Can’t wait for it to arrive! Thank you for your wonderful podcast. So informative, fun and inspiring! Love it. I really enjoyed listening to knit.fm, and I think Quince is a great model for a new direction in yarn production. Thank you for the giveaway! One of Hannah’s designs was the first knitting pattern I ever bought 6 or 7 years ago. She has done so many great things since then. Great episode! This was my first listen! What a fabulous podcast. It was good inspiration, all by itself. Thank you for putting it together. Knitting, and listening to this inspiring podcast, is keeping me sane this year while I write my Masters Thesis. So far, as stress relief and as a reward for writing 🙂 , I have knitted several gifts. However I would absolutely love to knit one of Hannah’s designs as a treat for myself! Thank you for doing this awesome give away and making another wonderful episode. I always learn something new after listening to your podcast ,so thank you for that as well. I first purchased one of Hannah’s books at my first ever local yarn store,here in Minnesota named the yarnery. Sine then I have been dying to get my hands on her Knitbot Yoked. Ashley, your podcast is just lovely – thank you for bringing it to us. I would love at some point if the website was more optimized for cell phone use. A few examples are trying to go back to a specific older episode is really difficult and the scrolling through comments takes FOREVER because you get so many 🙂 Nothing terrible or end of the world, but a suggestion that’s hopefully helpful. I have listened to this one twice now! AMAZING! Thank you!!! Another wonderful podcast. thank you for interviewing Hannah Fettig. i love her designs. Wonderful episode. I love Hannah Fettig and Quince and Co.
I’m a new Woolful listener and I’ve found so much inspiration in listening for both my spinning and knitting! This episode was so relevant! I immediately downloaded the knit bot app and loved the discussion with Hannah. The man on the street question was perfect. Just what I needed as I pick up a new knitting project after a long hiatus. Thank you! I’m so excited! I just might win, and get to try the patterns and yarn everyone is talking about! Thanks for a wonderful podcast! Great episode, always wonderful to hear about another person’s process. I’m really excited about Home & Away – such a beautiful book & patterns. I’ll be listening as soon as I can! Oh, I can’t resist the chance to win some Quince yarn- I’ve never tried them but have been ogling Owl for months! Thanks so much for your wonderful work here and in the community- it’s so appreciated! Thank you for another great podcast! Hannah’s designs are lovely! Thank you for all of the inspiration and introducing us to so many amazing people. how to choose? just one? lovely episode. Learning so much from your podcast! I’m a new knitter but I’d love to make that sweater on the cover of Home & Away. I have finally caught up on all your wonderful woolful episodes and am in time to enter a giveaway how exciting! So inspiring to hear all these different journeys thank you for bringing them together! Another great episode! Thanks to the sponsors for a chance to win such a great prize. This was a great episode!! And what a great giveaway! I’m definitely adding the book to my wish list. Just finished listening to the back episodes and now I’m fully caught up. I love the podcast and the fantastic interviews. Thank you! I love Hannah’s new book! Wonderful interview! I love this pattern collection – such beautiful wearable pieces. Quince & Co. is utterly fabulous yarn too, what a special giveaway. Thanks for another fabulous episode! Love the podcast and enjoy learning more about the fibre world. I love your podcast (& KnitFM too). And I love all the adventures in your life (motherhood, puppies, kittens…). Thank you for everything! Loved KnitFM, and am hopeful for more episodes! Wonderful interview. I have to say, Quince&Co is some of the loveliest 100% wool around. I also like Pam Allen’s vision around her company. I am a big fan of Hannah Fettig’s simple, wearable designs. I loved the interview with her and would really love to win a copy of her new book, not to mention the Quince & Co. Yarn!!! Hope I’m not too late to the party! Love your interview this week. I’ve been thinking about the “grace of knitting” all week. Would love to win. Thank you! As a follow up, I just watched the stashbot video. Genius – both the app & the hilarious, spot-on video! Thanks for another giveaway. I get my mojo back by making small, quick, fun projects. This was such a great interview. I love Hannah’s designs and use my Stashbot app every time I visit my LYS. It is such a useful tool. Thank you for such a great giveaway! Ashley, I found your podcast and website when you were a sponsor for knit.fm and am so glad I did! I’m going back through and listening to all the old episodes and am learning SO much! Thank you! Such a generous giveaway! Thank you for the chance to win and your wonderful podcast! Thank you so, so much for your beautiful curation of fiber inspiration! Hannah is one of my favorite designers and since we just returned from a family vacation to Portland, ME, I feel like I “know” her just a little better now. This episode was so enjoyable: I would love to win the giveaway! So inspiring to hear Hannah’s story. Her designs are brilliant! Black Sheep Gathering sounds like such a good festival! So many awesome vendors are going. I was up in Eugene earlier this year for work, and I so wish i could justify going up there again for BSG. I need to check out her podcast…….this was another great one Ashley! Would love to win! Never knitted with quince before! Would love to win this giveaway!!! Such a huge fan of Hannah Fetig and would love to win her new book, and of course the yarn. I would so love to knit the Rosemont cardigan. I attempted it when Hannah first released it separately from the Home and Away collection, and I hadn’t yet learned the importance of gauge. The cardigan was a hilarious monstrosity, and a good learning experience-I’d love to attempt it again. I love Quince yarns – I’m knitting a sweater out of Chickadee right now, and the yarn makes the stitches just pop! I look forward to listening to this episode! I LOVE Hannah’s designs and just spent ages drooling over Quince and Co’s yarn lines before seeing this post! Clearly it was meant to be! Loved this episode! Would love to make one of Hannah’s beautiful patterns soon <3 Thanks so much for bringing us together with these fiber inspirations every week!! What a generous give-away…….and one I’d love to win! As a new listener to Woolful, I’m looking forward to catching up on past podcasts. This was a great episode. And what an amazing give away! What a delightful giveaway! Thanks for the opportunity. Beautiful book! I have yet to try knitting a sweater, but this would be a great push in that direction! This is one of the most desirable giveaways I’ve yearned for yet…LOVE BOTH THE YARN AND THE BOOK! What an exciting giveaway. Your podcast and IG feed are always inspiring. I have always wanted to try Quince&Co. Yarn to knit up something dreamy! Hannah’s new book had some very beautiful pattern that I would love to try! A great episode AND a dream giveaway? Pinch me. Great interview and an exciting giveaway! Thanks again for a wonderful podcast! I would lovelovelove to win this giveaway!! Thank you for offering it! Great episode as always! I typically quilt while listening, but boy – a sweater’s worth of yarn? Fabulous! Keep up the amazing podcast job – your intelligence and dedication shine through every episode! What an inspiring podcast. I love every listen! Oh my! I love Hannah’s designs and quince yarn!! Always abs inspiring podcast. What a generous giveaway! Love Quince and love Knitbot! Awesome giveaway! Love this book, yarn and podcast! You are doing such good things through this podcast. Keep it up!! I’m currently working with Quince’s Sparrow for a knit tank, and it’s a dream. As a new knitter, it’s taking me forever, though 🙂 I’ve been eyeing Home & Away since it came out, and would love love love to learn from it! Thanks to you and Hannah for all your hard work, it is so appreciated. This episode is great! I can’t wait to try a pattern from Home and Away! Seriously in love with every single garment in the book. Great podcast! 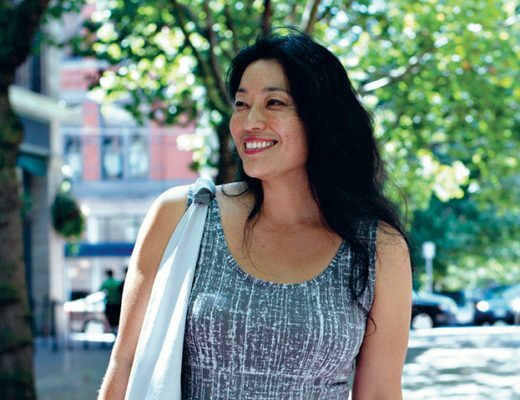 Interesting woman, and an interesting interview. Wow! I would love to win…have been meaning to try Quince yarn! Well grat podcast nd great giveaway, need to listen to knitfm! I’ve learned so much about knitting, designers and wool since I started listening to your podcast! So much woolly fun! Thanks for the chance to win. Hannah feet tig plus quince yarn. The best giveaway ever! Thanks for entering me. I really enjoyed the interview with Hannah. Especially her description of the knit.fm series with Pam Allen. What an amazing giveaway! I love listening to your podcasts each week and would be so delighted to win Hannah’s book and this lovely yarn!! have learned so much through listening to your podcast. bought some lovely cormo yarn. This week’s give away is so awesome, thanks! Oh I am looking forward to listening to this one (I am a touch behind). Hannah’s work is gorgeous. The first time I came across Quince & co yarn was in Portland Maine. I just couldn’t leave the yarn store without a few skeins. Started knitting only 6 months ago. I’m hooked. I am now knitting my first sweater. This once seemed way too difficult for me. I owe the online knitting community, for helping me out, inspiring and motivating me. So Thank you for what you guys (knitbot and woolful) are sharing!! I love Hannah’s designs! Would love to win this week’s giveaway! Fabulous! I cannot wait to listen. After many years, I have started knitting again, and am so impressed with the patterns that are now available, and the wonderful supportive wool community. It’s a lovely feeling to hand make something that stands up to the best commercially available garments, and supports small growing industries. You are all so clever! I miss KnitFM. I listen to every episode. I’d love the opportunity to work with Quince yarn and the latest Hannah Fettig patterns. Two of my favorite podcasts (Woolful and Knitfm) smashed into one! I feel like 75% of my knitting and yarn knowledge comes from you two and it is so appreciated! Thanks for having Hannah on your podcast and for being a continual inspiration to keep branching out of my comfort zone and try new things all the time. Loved the episode – Woolful is my favorite podcast in my feed! A terrific interview! I love Hannah’s designs. Fingers crossed to win this awesome & generous giveaway!! Loved the episode! I have this book on my list of things to buy, it would be great to win! Enjoyed this episode. I discovered Stash on a road trip through Oregon. Such a pleasant and welcoming space and I wish there had been time to sit and knit which I was invited to do but alas, the road called. I love Hanna Fettig’s designs and quince wool is so so lovely. Thanks for putting together a great podcast. This is such a GREAT giveaway! I would absolutely love to own this book and knit one of the many amazing projects!! Can’t wait to listen to this episode! I’ve never knit with Quince yarn before, I’m grateful for the opportunity to win some. Thank you for a great episode and a great giveaway! The book looks stunning and I haven’t knit any quince & co. Yarn yet, this would be the ultimate treat! A friend recently introduced me to this blog and I am IN LOVE with it. I’m having so much fun listening to this podcast and enjoying the great conversations! It’d be fun to win! Tuesday’s are my favorite!!! I love all of the stories and inspiration. And I’m so excited about the home and away book!! This is an awesome giveaway. 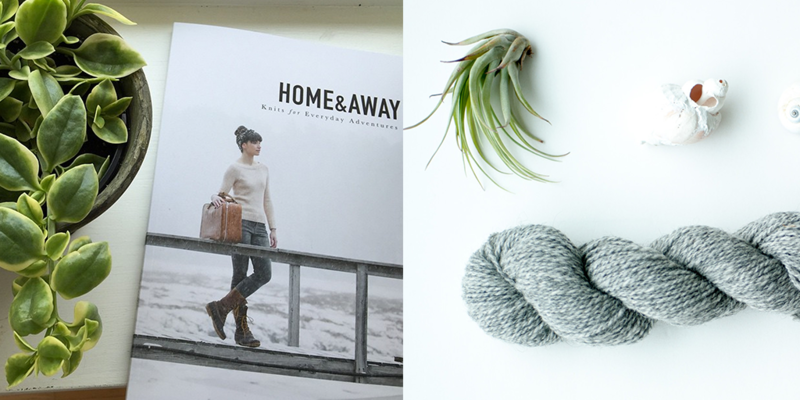 I have been eyeing this book and dreaming of knitting with Quince & Co for a while now. Thanks! would love this book!! thanks for another great episode! Such beautiful images on this post, I’m very inspired by just browsing the photos. I would love to win this giveaway. I am a new listener and going through the episodes has been such an enjoyable part of my day. I would love to win this giveaway. I would LOVE to win!! The sweaters are all so beautiful! Great interview with the Talented Hannah, I so admire her design talent. Lovely giveaway too! I love listening to your podcast and learning about the resources that are out there. I hadn’t heard of knit fm and now I get to work those episodes, too! Thank you for doing this podcast. It is so informative and inspiring. I love what your doing, this is an excellent program. Swoon! 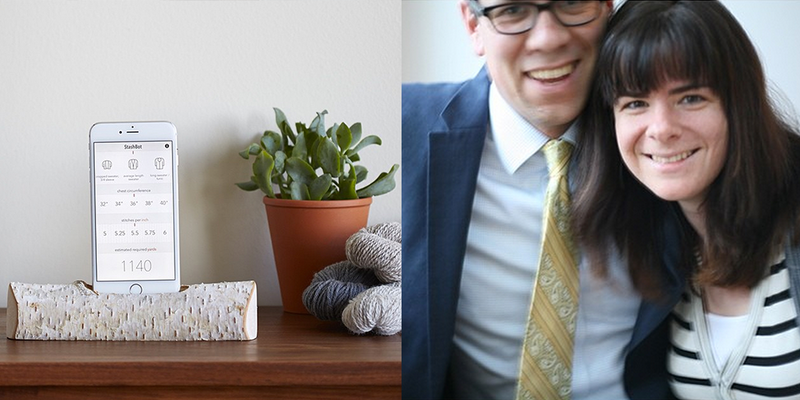 Two of my favorite fiber things: Quince & Co. and all patterns Hannah Fettig! Love, love, love this episode. I’m a Pam Allen groupie. It would be awesome to win this prize. So happy that Hannah was a guest on this episode of the podcast. I have loved listening to her and Pam on knit.fm. I can’t get enough of these fantastic podcasts. Great job again Ashley! I love Quince & Co yarns! Thanks Hannah & Ashley!! I love Quince & Co yarns! I’m currently knitting a Kate Davies sweater with Finch and its glorious. I love quince and I love knitbot patterns! What a delightful opportunity! Love Hannah and her patterns! Another great podcast! I love all things Quince. I am going to do the knit along. This will be my first one. So excited to hear more about it and get started. Thanks ! I love Woolful and wait on pins and needles every week to listen to the latest episode! I feel so grateful that I stumbled upon your feed on Instagram last fall. I was just starting to go down the “rabbit hole” of research for my dream of opening a mini mill. I immediately loved your feed and was so inspired and encouraged to find someone else who is trying to do the same thing that I want to do with my life. I have been introduced to so many great fiber folk and resources through your feed and the Woolful podcast. Hannah’s designs are so beautiful and her shapes are definitely my style. All the designs in Home & Away are inspiring, but I would love to knit the Georgetown as it would be my first sweater and I feel like it would be a good starter sweater project. Also, it uses Quince & Co. Owl which is a 50% Alpaca/50% American Wool blend which sounds absolutely dreamy. I’ve been wanting to try Owl as I adore Alpaca/Wool blends. Thank you for everything you are doing to connect and inspire the fiber community. It took me an unseasonably long time to figure out that Hannah Fettig was the very same Knitbot. I don’t know why, it’s not exactly a secret. But when I figured it out suddenly everything made sense. She always has such lovely designs. Great to listen to your conversation! oh WOW! i loved this podcast with hannah, so sweet and an amazing talent. crossing my fingers to win her book. thank you ashley and hannah! Loving your podcast, it has been keeping me company while I garden. The interview with Hannah was great, I love her simple, wearable designs. Lovely prize! The book looks very inspiring! I am so happy I came across your podcast! and quince and co, what an amazing giveaway! Another great episode! Tuesday is fast becoming my favorite day! Love this podcast. Another awesome episode! So good! I love this podcast. I just found out about this and followed from instagram. And where I do most of my listening I was listening to nina simone and spotify playlists I switched to listening to this while throwing on my wheel. Its strange how calming and soothing it is hearing about others creative journeys while on my own. So yeah Favorite podcast to date. And even if I don’t win any prize I really still have in finding woolful. Its pretty fortifying. Hey, that’s Archer (@archerthebichonpoo) in the 4th row of pictures!